FCM3661 vise-jaw inserts are a must for race teams, engine builders and street rodders. Keep your goodlooking Aeroquip Performance Products fittings looking good even after assembly. FCM3661 visejaw inserts firmly hold the hex of the fitting during assembly, without marring the anodized finish. Made of aluminum with angled pockets, FCM3661 vise-jaw inserts can be used with any size fitting from -03 to -32. 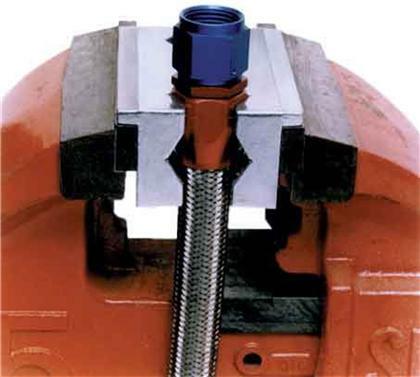 A horizontal pocket the length of FCM3661 vise-jaws is ideal for securely holding steel braided hose in place, making straight cuts fast and simple.